Pioneer replaces SC-LX56 and SC-LX86 Award-winning AV receivers | What Hi-Fi? Pioneer has unveiled a quintet of new AV receivers, including replacements for last year's Award-winning SC-LX56 and SC-LX86. There are three new 9.2-channel models – the SC-LX87 (above, £2000), SC-LX77 (£1600) and SC-LX57 (below, £1200) – joined by a pair of 7.2-channel units, the SC-2023 (£850) and SC-1223 (£650). The SC-LX57, SC-2022 and SC-1223 will be available from July 2013. The SC-LX87 and SC-LX77 will be in the shops from August. The top two models are THX Ultra2 certified and were tuned at Air Studios in London. All five incorporate Pioneer's latest Direct Energy HD amplifiers built on Class D technology, AirPlay, DLNA 1.5, vTuner internet radio and the option of Bluetooth streaming using the company's AS-BT200 Bluetooth adapter. If you want wi-fi, the AS-WL300 wireless LAN converter comes as standard with the top three models and is available as an option for the SC-2023 and SC-1223. 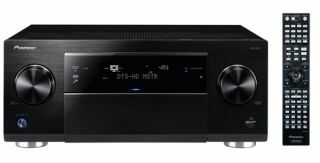 Geoff Loveday, Pioneer's product manager, says: "Our 2013 range of high-end home cinema receivers produces superior sound quality to match the immersive 4K viewing experience. They come with expanded connectivity, multi-zone capability and highly efficient power output." Common across the whole range is 4K Ultra HD passthrough and upscaling, multi-zone capability, and an improved control app called iControlAV2013. The latter features a new interface and an easier-to-navigate menu for smartphone users, as well as a dedicated 'Eco Manager'. A new 'Push Player' function allows music to be streamed directly from a portable Apple or Android device. There's support across the line-up for high-resolution music files and gapless playback, including compatibility with DSD, AIFF, Apple Lossless, WAV and FLAC. In addition, the top three units get an ESS Technology Sabre 32-bit Ultra DAC, and a 192kHz/176.4kHz 32-bit Audio Scaler for upscaling standard CD music to "high-resolution audio". Each receiver is iPhone and iPad certified, including iPhone 5 and iPad Mini compatibility, while Android users get MHL 2.0 (Mobile High-Definition Link) support and there's even HTC Connect compatibility for use with the likes of the HTC One. Pioneer has increased the number of HDMI connections, with nine HDMI inputs and three outputs on the top three models, while the other two get eight HDMI inputs and two outputs. Finally, the flagship SC-LX87 gets an asynchronous USB DAC, allowing direct USB connection to a Mac or PC with support for 192kHz/32-bit music files.